It has been alphabet week on the picket line. First it was glass gems, and then wooden blocks. We get a lot of wind here in the spring and fall. We also have a lot of trees. Every time I clean up the yard after a wind storm, I always look for "good branches". Branches that will make good blocks. They get hidden away so that they don't become fire wood, until they are dry. Last spring, a perfect branch fell down. Long, just the right diameter. I knew that it would make something wonderful. Handsome husband chopped them up during the summer. 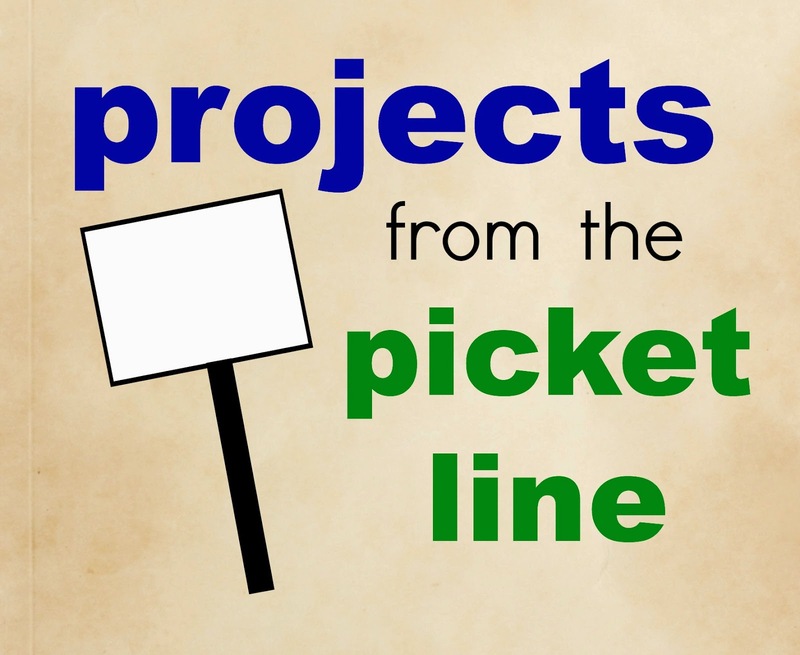 And last week, I took them to the picket line. and they were ready for the alphabet. Capitals on one side, lower case on the other. You will just have to trust me that the lower case letters are there. Forgot to take a picture. Three colours: purple, teal and green. When the pickets come down and we are finally back in our classrooms, these blocks will be added to other tree "cookies". And, as usual, I can't wait to see what the kids will create with them. Makes me wish I had trees with good branches like that falling and a set of power tools! :) I love how natural they are. I hope some good branches fall in a safe place and some power tools come your way soon. Thinking of you on the picket line Sandi. Feeling so sad for your beautiful kids who are missing time with you, fresh bread, handmade learning tools, and love. You are wonderful, Kimberley. A true gift. I'm excited to comment to you for the second time! Sorry to hear about being on the picket line, I hope everything works out for you in these trying times. 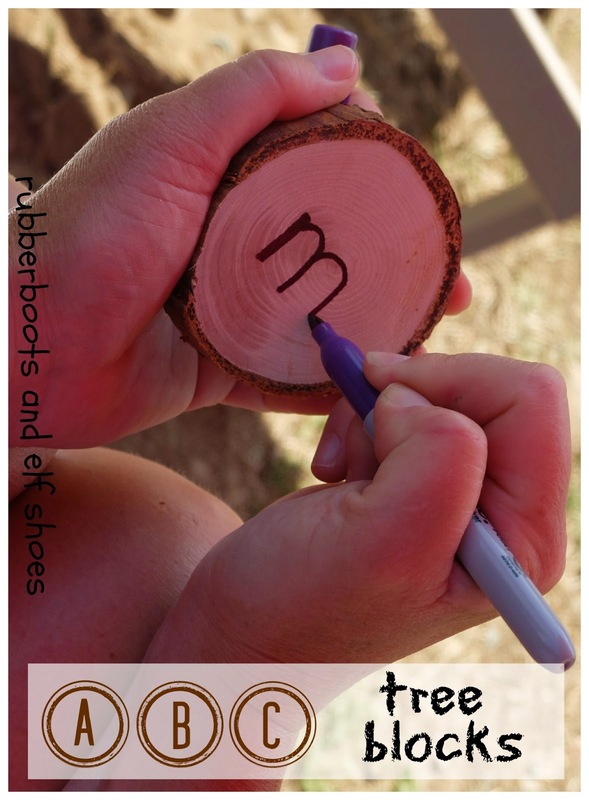 I LOVE this idea of turning tree branches into a teaching tool for the children. 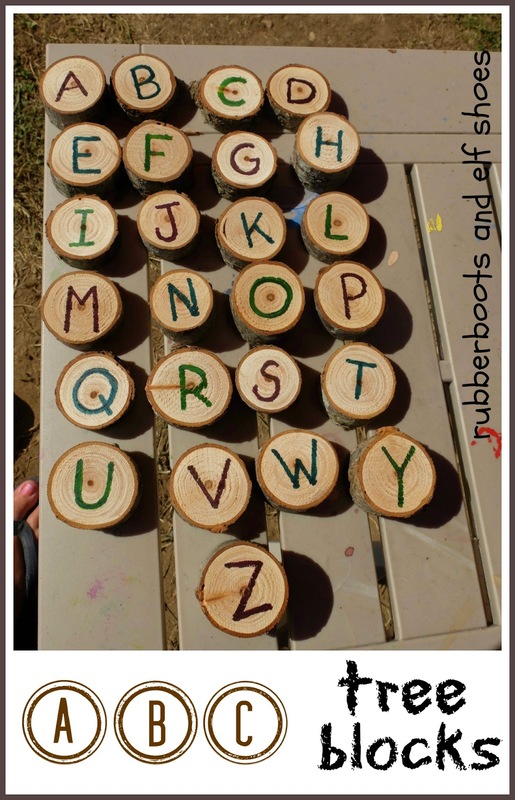 Such an easy way to use your DIY skills to better the classroom with these letters. I most definitely will try to make this Tree Block Alphabet even if it gets the best of me and doesn't turn out as great as yours! Again, your posts are so fun and you do great work! Thank you for sharing such creative ideas that I can hopefully take to my future classroom. I am also publishing a blog post today (9/14/14) on my blog summarizing my comments to you if you want to check it out! Also, anytime you want to visit my EDM 310 Class Blog that would be great. What a unique idea! ABC tree blocks are great and I'm sure that it fascinated a lot of kids too. This ABC block is natural and the good thing is that it came from branches that accidentally fell off a tree. Thanks for sharing this awesome post! It was a windfall branch - no worries - no tree were hurt in the making of this project!! I love how natural materials bring a sense of wonder to a classroom. What a great way to reuse tree branches and bring nature into learning! Stopping by from Share It Saturday where this post was featured. Thanks so much for featuring our blocks - and for hosting Share It Saturday every week. What a great idea for incorporating nature into learning. This is awesome! I was just telling my husband we should make some blocks from a few branches in our backyard! I love the idea of adding letters to them!